Quorum Corp. is forecasting 12.6 million tonnes of ending stocks for western Canadian crops, well above the previous five-year average of 8.3 million tonnes. One, a heavier total supply to begin the 2018-19 marketing year is certainly a possibility, and it’s important to acknowledge it. Two, are you one of the farmers holding a lot of old-crop over, into the new-crop marketing year? If so, some thoughts for you. Let’s talk about the supply picture first. As all farmers know, the total supply of any particular crop at the beginning of a new crop year is determined by what’s left over from the previous marketing year (ending stocks), added to that year’s production. In most cases, a hefty old-crop ending stocks level is a bad thing for prices, helping to keep total supplies heavy even when farmers may have throttled back on new-crop production. But in other cases, larger-than-normal ending stocks can be a blessing, providing farmers with some security in the bin when the crop in the field may not look like it’s going to produce much. This year, the heavier stockpiles could be a blessing OR a curse, depending on the crop involved and depending whose chair you’re sitting in: the buyer’s or seller’s chair. 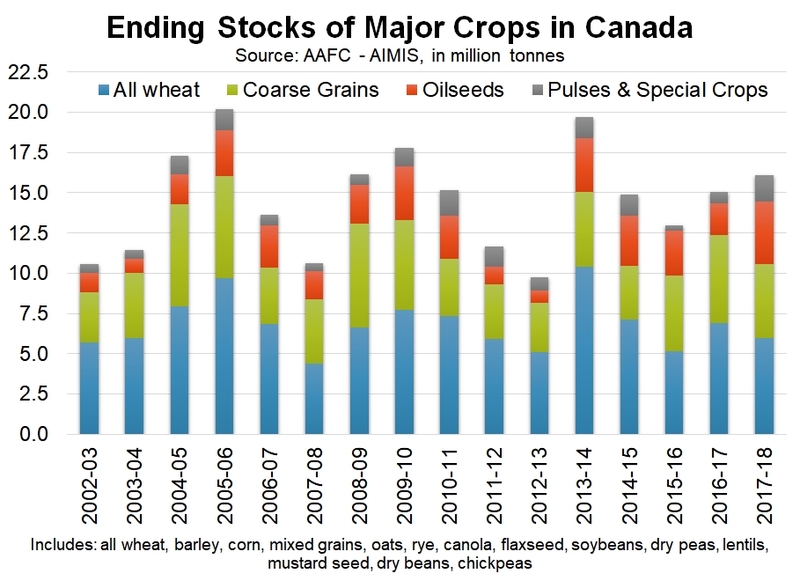 As the graph here shows, current Agriculture Canada projections suggest 2017-18 total Canadian ending stocks could be the heaviest since 2013-14. Graph here shows all-Canada ending stocks estimate. In the story noted above, Quorum Corp. attributes a good portion of the heavier 2017-18 ending stocks to poor grain movement during the winter by the railways, and that’s probably a fair statement. After all, the interim president and CEO of CN Rail publicly apologized back in March for the railway’s failure in meeting its own service standards and the expectations of its grain customers. It’s also worth noting that it was primarily slow rail movement that caused the big backlog in 2013-14. Farmers are big holders in driest areas. But the weather on the Prairies probably needs to take some of the blame for this year’s situation as well. Admittedly, conditions in some parts of Western Canada has been excellent and crops look promising. But in others, the dryness that began last year is continuing to linger, with the added negative aspect of subsoil moisture now being almost completely exhausted. In still other areas, crops were hit hard by cases of too much moisture back in early June. In those areas where the weather hasn’t been ideal, at least some of the heavy ending stocks can be traced back to the reluctance of farmers to empty their bins of old-crop supplies, just in case the 2018 crop does end up falling short. Good idea to hold old-crop? Or not? It’s always hard to sell inventory in the bin when your own crop in the field is burning up in the field. And sometimes, it’s a good idea to hang on. One example would be if you’ve made a forward contract and want to hold some old-crop back in case your new-crop falls short of meeting the commitment. Another would be if you’re concerned about the quality of the upcoming harvest and want to keep some old-crop to blend it up. Or maybe you want to hang on because your analysis of the supply-demand situation points to minimal downside risk, versus greater upside potential for prices. That might make good sense. Here’s yet another example when hanging on to old-crop inventory through into summer can pay: You’ve snagged a deferred delivery contract that pays a big premium over the spot market! However, oftentimes, people hold the old stuff just because they figure if their own crop looks bad, total production will be down and prices will rise. The mentality is that if my crop is bad, lots of others must be bad too. And the market “has to” go up. For crops whose prices are set based on local supplies, that strategy might work. But for more mainline crops like wheat, canola, soybeans and corn, it can be a bad idea to hold on too long. For those big crops, the markets don’t care about conditions on your farm. Those markets pay attention to continental and global factors. A dry pocket in Western Canada isn’t going to rev up futures. Sometimes it’s a bad idea. Sometimes holding old-crop through to harvest-time is like kicking yourself when you’re already down. You wind up hanging on to old-crop for a lower market, and having a drought-stricken, smaller new-crop harvest to sell. A double whammy. Want to keep up on what our weekly Market Advisory Service newsletter is saying about selling versus storing? Click here for a trial run.